The Innersleeve is technically the paper covering that is closest in contact to the surface of the recording. The term "Innersleeve" is synonymous with terms such as "dust sleeve", "liner" and "album liner". More often than not, an innersleeve is inserted into a jacket or some sort of outer packaging. 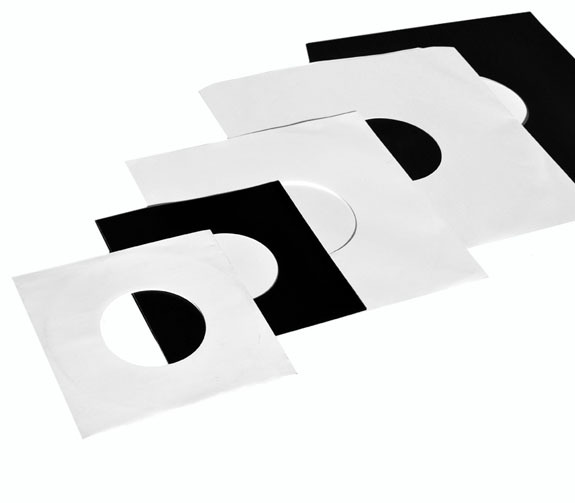 By default, all of our records are inserted into "Standard White Paper Innersleeves w/ Two Diecut Center Holes", but our standard options also include Polybags and Picture Disc Sleeves, Poly-lined Innersleeves, Black Paper Innersleeves (normal and poly-lined), as well as Printed Innersleeves. All of our options except the poly-lined sleeves are available with one center hole, two center holes, or no center holes, and most Innersleeves are available in a variety of custom shapes, stocks, finishes, loading configurations, printing, and other options.